So I may have gone a little bit crazy with the football food. 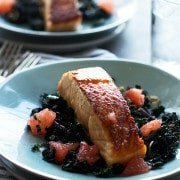 But the ideas are overflowing and well, Kevin really likes football food, so it’s easy to keep churning out recipes daily when they’re met with such gusto. We also happen to be watching a lot of football, so it only makes sense to pair countless hours of ball tossing and fantasy football references with the appropriate type of food, right? Like chili dogs, before Kevin I wasn’t really into buffalo chicken (burgers and cheese dip were more my thing), of course I’d inhale anything buffalo chicken in a second if I was out at a friend’s house or eating and drinking at a bar, but mostly likely you wouldn’t see it coming out of my kitchen. 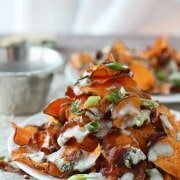 The blogging world has also helped to catapult the buffalo chicken craze from wing-loving dudes to the general population (including myself) and because of that I feel like the words, buffalo chicken, are synonymous with football season and a must for any viewing party. 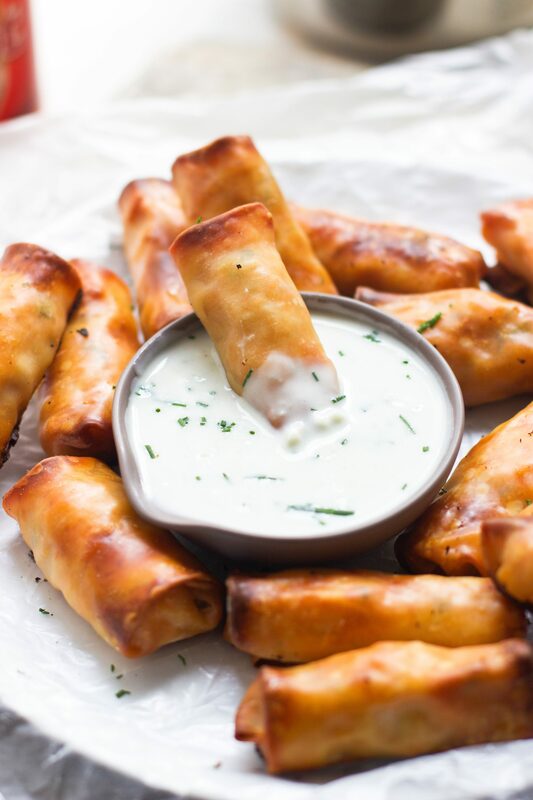 These baked mini buffalo chicken egg rolls might be my favorite spin on the classic football food yet and hit the three points, that in my opinion, make certain recipes the holy trinity of football foods. One, they’re buffalo chicken, duh. Two, they’re bite-sized. Three, they’re dunkable. 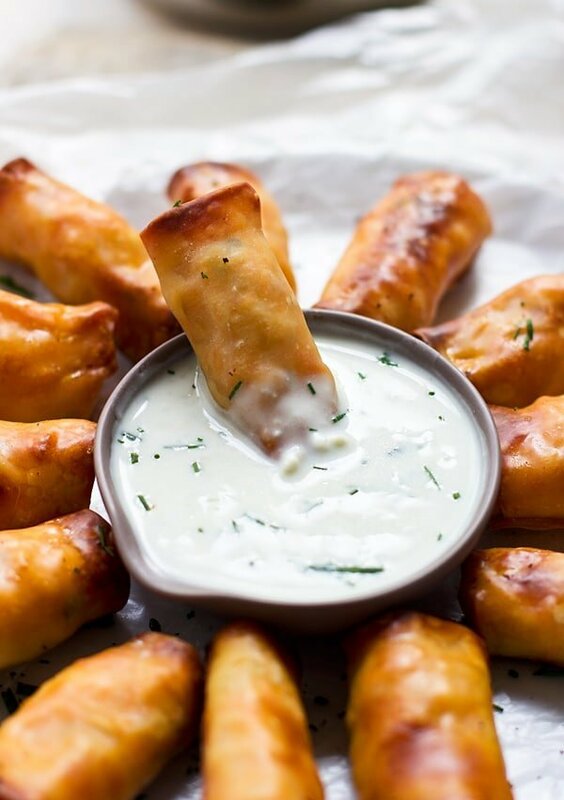 So basically, they’re finger food perfection. But like I said, here we’re stuffing the filling into teeny tiny wonton wrappers. I initially toyed around with the idea of making full-sized egg rolls, but as Kevin pointed out eloquently, “People love bite-sized,” and I agree. So, these can be a wee bit tricky. You have to have the perfect amount of filling and position it correctly for these to wrap up nicely. For me, I found that a heaping teaspoon was the goldilocks of measurements and I placed it a line on the front third of the wonton wrapper with a border around it so no filling could escape. 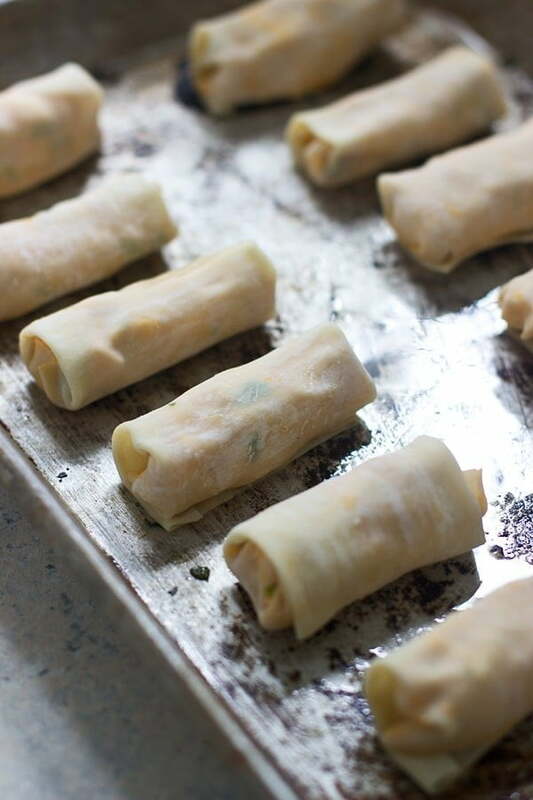 From there, you just wrap them up as you would any egg roll — tuck the sides in and roll. I also tried two methods to cook them, one, brushing them with egg wash and then baking them, and two, just popping them in the oven as it. Both yielded a crispy exterior, but I found the egg wash to be unnecessary, but if you want that shiny skin, go for it. 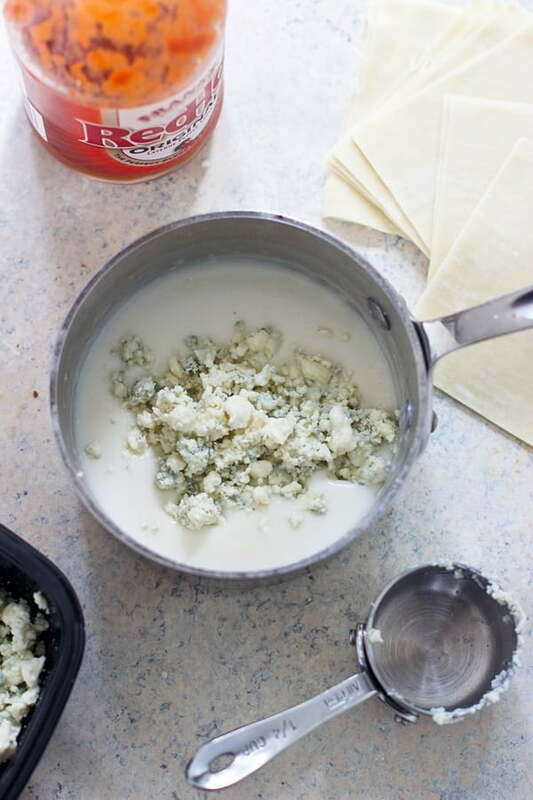 While the baby egg rolls are baking, I threw a super quick blue cheese together with a little bit of butter, flour, whole milk, blue cheese and just a touch of salt for dunking — and because I can’t have buffalo chicken without blue cheese. Dunking required. Happy weekend all! Buffalo chicken stuffed into mini wonton wrappers, baked and dunked in blue cheese dipping sauce -- the PERFECT football season finger food! Preheat oven to 400 degrees. Grease a baking sheet with non-stick cooking spray. 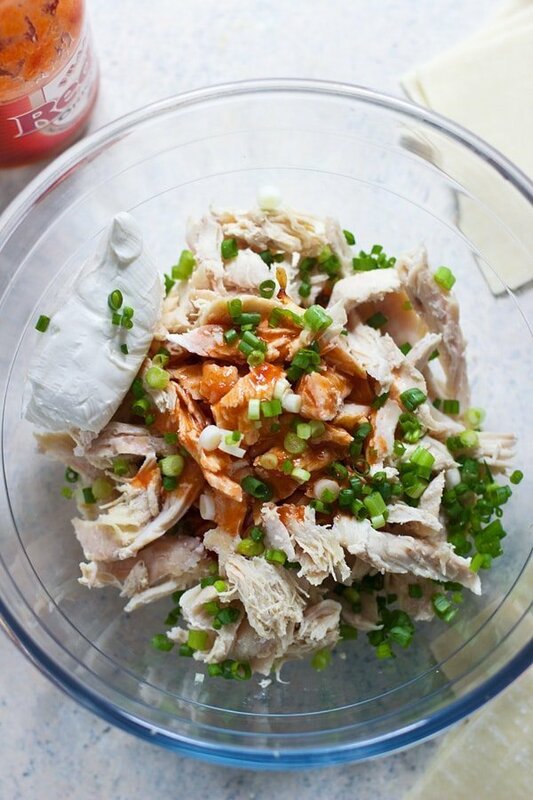 In a medium bowl, combine chicken, buffalo sauce, green onions and cream cheese. Fill a small bowl with water. Place one heaping teaspoon of filling on the front third of each wonton wrapper leaving a slight border around the edges. Use your finger to moisten the edges of the wonton wrapper. Tuck the sides in and roll up, jelly roll-style, place seam-side down on baking sheet. Repeat with remaining wontons and filling. Bake egg rolls for 12-15 minutes or until golden brown and crispy. 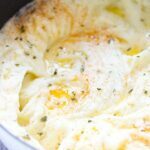 Serve with blue cheese sauce. 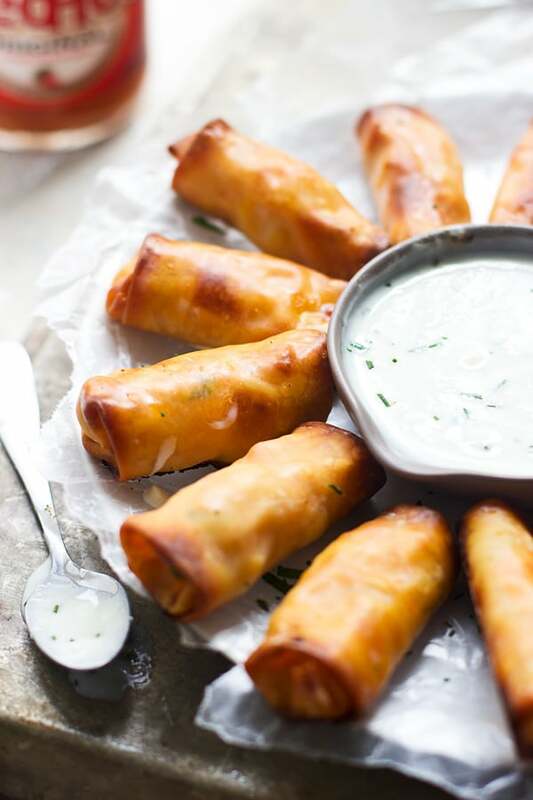 31 Responses to "Baked Mini Buffalo Chicken Egg Rolls with Blue Cheese Sauce"
This looks like a buffalo chicken appetizer that I can get behind! I love the buffalo cheese dip that’s abundant this time of year, but my stomach can’t always handle it. I love that these are baked. Perfect snack for football! I like that you baked instead of fried these little nuggets. 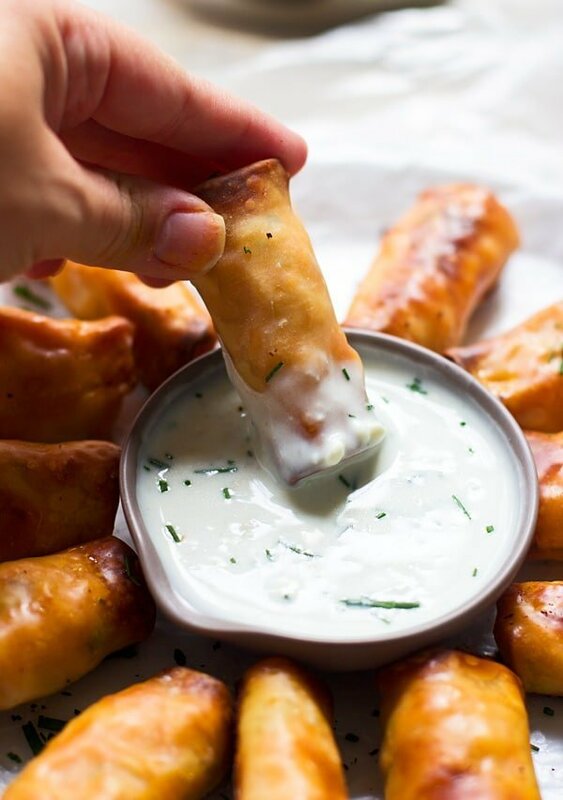 Man, they look totally dunkable in that blue cheese! I am the total opposite this year! I have like zero ideas for football food! haha I’ll just make all yours instead for game day 🙂 These egg rolls sound awesome! Is it possible to make too much football food? Nahhh. 🙂 I’m blown away at how crispy these looks when they’re baked – they look so delicious! These look fantastic Nicole!! Loving the blue cheese sauce! Next time, I’d go with just good ol’ Frank’s Hot Sauce. But the core recipe for the filling is genius. Can’t wait to try the tortilla pinwheel wrap version. Awesome! So glad you liked them Brian! Just tried these followed recipe exactly, they seemed to be a little dry. Very tasty just dry. Any suggestions? Sorry Jay! Maybe add a little bit more buffalo sauce? Would these freeze well? 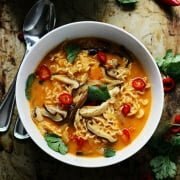 Thanks so much for the amazing recipe! I just got done trying these and they didn’t turn out the way they are shown above. I did a slight variation of the filling (I made the chicken in a slow cooker where it cooked in ranch mix powder and hot sauce [I use Louisiana] and then mixed the other ingredients as per the instructions, but I think the cream cheese might be a little heavy handed, which I still liked). The real problem is the cooking. They only browned on the very edges and only got kind of crunchy everywhere else, almost like not done enough pasta. They were alright and the flavor masked the texture pretty well, I just would have preferred the finished crunch and brownness. I honestly might just fry them in the future, but any tips would be great. Hi Kristen! Did you brush the egg wash all over? You might just need to cook them longer or turn up the heat on your oven a little bit. Every oven is different, so yours might not have been hot enough to get that crisp brown all around. They would also be great deep-fried! I do, just lightly! I will update the recipe. Sorry for the delay! Hi Emily! 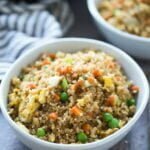 So sorry, I don’t keep nutritional facts on the blog! 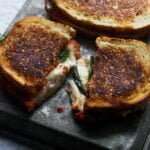 If I freeze – do I do that before I bake them or after? Thawing/reheating instructions? I would do it after you bake them, then just warm them in the oven straight from the freezer at 350 degrees. I haven’t done this, so hopefully that works! We are trying these tonight and was wondering how did you cook the chicken? I just used store-bought rotisserie chicken! If you want to cook up your own chicken, just season a few chicken breasts with salt and pepper, bake at 350 degrees for about 15 minutes, then shred! Yes! Hats exactly what I would do!